Authorities in southwest Iowa this week arrested a motorist after a K9 sniffed out drugs in a couple of gift wrapped boxes. The packages were wrapped with bows. More marijuana was found in a garment bag, along with $6,500 in cash. 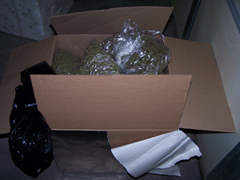 “There was about 65 pounds of what we believe is high grade marijuana,” Danker said. Klein was charged with possession of marijuana with intent to deliver. She was released on bond Monday. Drugs found inside boxes wrapped as wedding gifts.